Our new low profile hydration system is designed for ballistic vest integration. Maximum utilization of our low profile technology reduces the depth of the carrier making it a truly low profile hydration system. 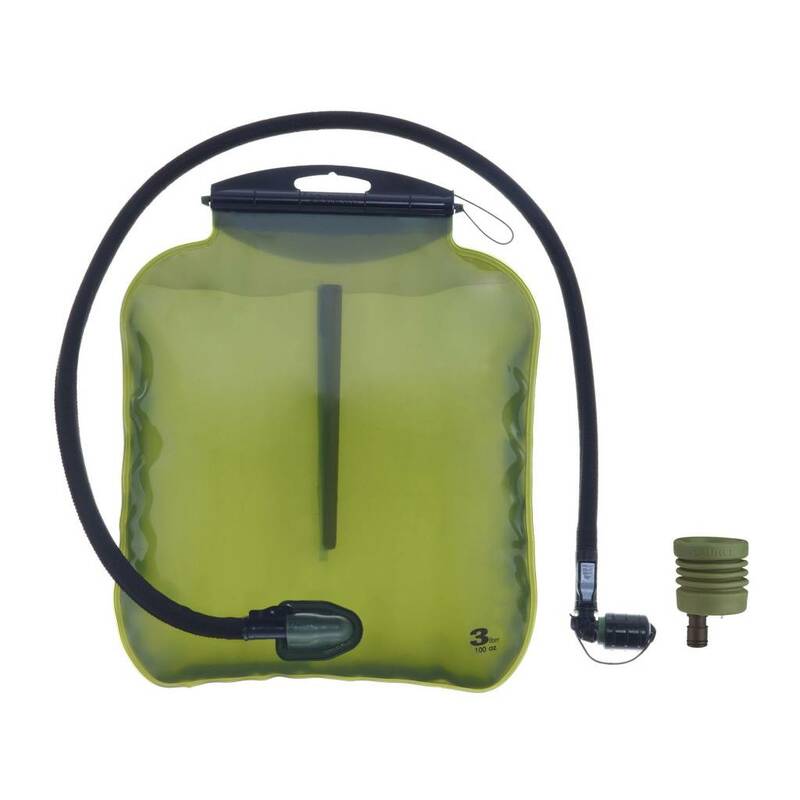 The ILPS resorvoir allows for a liquid volume of 2L when inserted into a vest, and allows for 3L inside a pack. 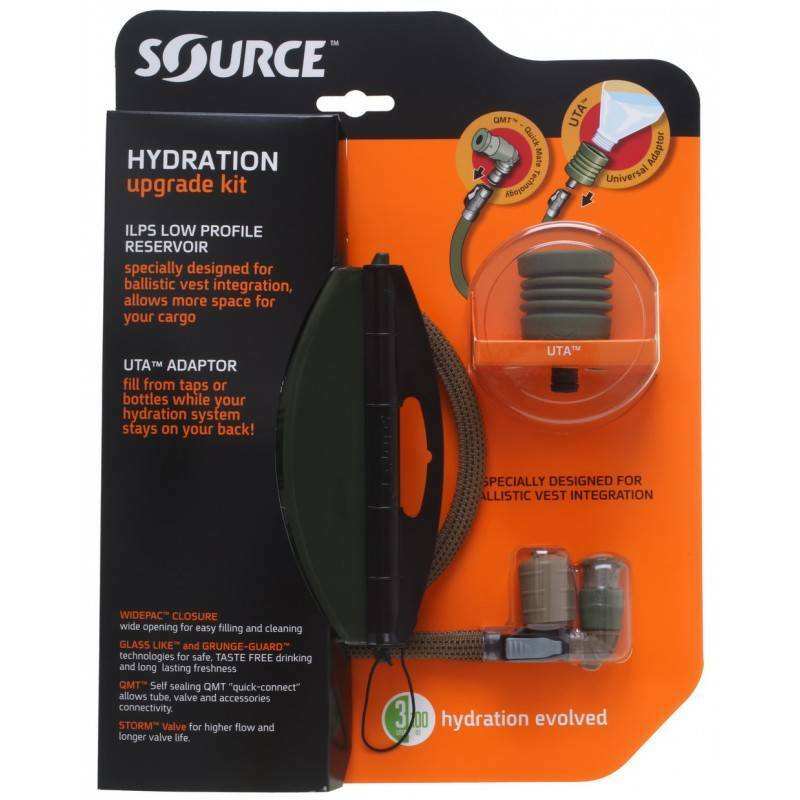 Order now on SourceTacticalGear.com and get it in a convenient kit with our UTA Rapid Refill Adapter. Horizontal bladder QMT™ - Allow the drinking tube to be routed out of the ballistic plate pouch, without kinking the tube. True Low Profile - Consistent thickness throughout the surface of the reservoir. The system maintains its constant thickness even while being carried upright. Gravity isn't an issue and does not affect the bladder's shape. Hi-Flow Storm-Valve™ - No-bite push-pull valve with integrated shut-off mechanism. Like drinking with a straw. Easy disassembly for cleaning. (U.S. Patent 6,622,988). Angled Valve - Valve Turns 360 degrees for perfect valve/mouth orientation. Allows tube to be 25cm shorter. Less excess tube bouncing around the chest! Dirt-Shield™ Protective Cover – No more dragging in the dirt! Keeps valve free of dirt and protected. QMT™ - Additional In line SQCTM Quick Connector at the tube extremity, allows connection of filter, UTATM or other accessories with the push of a button. Cool Weave Cover - Tube Insulates and blocks UV-light. Water stays cool and 3 bacteria free from first to last sip. Widepac™ Wide Opening Access - Patented slide closure for easy draining and cleaning. Airtight seal. Technologie Glass-Like™ A multi-layer Polyethylene film utilizing SOURCE's Glass-Like™ technology, which prevents bio-film build up making the system self-cleaning. SOURCE's Glass-Like™ Film is 2000% smoother than standard TPU films, with virtually no difference from glass itself.